When I decorated our apartment for the first time, 10 years ago, I was very into the minimalistic theme until I discovered blogs and my style evolved ever since. Then sofa then bought was according to my then style, now I look at it and it does not move me. I really crave a white sofa, really bad. I feel the urgent need to bring my sofa to a re upholsterer and have it delivered back to me in a pretty white fabric. But having a 15 month old busy kid, will this be sofa suicide? 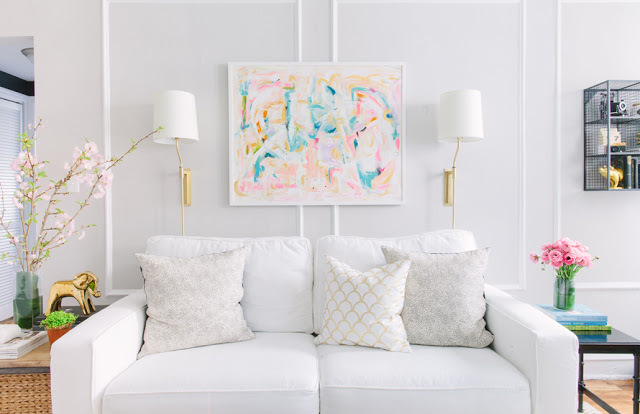 Anyone with a white sofa that can relate to me or that has a good tip? Please let me know. 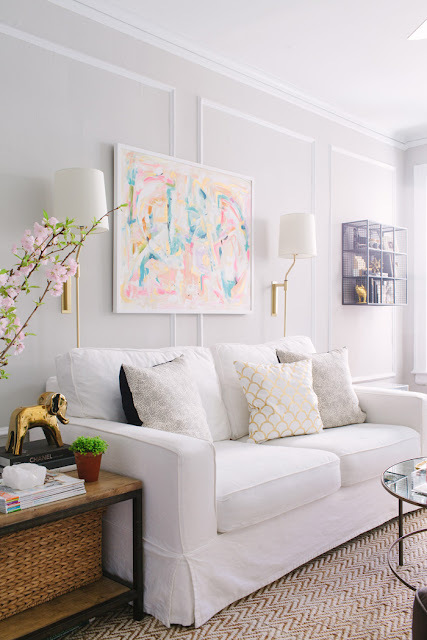 This beautiful white sofa is of Danielle Moss apartment of Breakfast at toast. 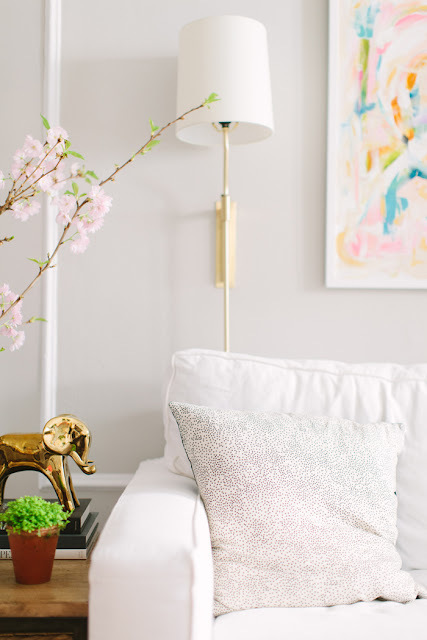 I am secretly wanting that gold scallop pillow cover from Caitlin Wilson textiles too. Hi, the sofa on the pictures looks great! But I have to tell you about my own experiemce with my 2,5 year old son when he was at your son's age. The white of the sofa will not survive. You would have to wash it and wash it again and believe me even a throw wouldn't help as they tend to pick everything that is capable of being misplaced!. But hey, that's just me. Sometimes our need to be stylish overcomes our need to be practical and that's not a bad thing in my book. I will wait with a white sofa untill he goes to college :) thank you for your kind advise and you are totally right! Chantal, from my experience, I had a white sofa for about 2 weeks, then all that money wasted, I just couldnt do it! I was too paranoid and my poor family ended up hating it too...ended up selling it and bought grey velvet :) Best choice ever! I love also a white sofa, especially the blue and white tandem in decoration. My mother decided to change the fabric of her sofa and it was reupholstered in white. She lives in a sunny house in front of the sea. The result was very pretty but not practical at all. It has to be washed several times a year (no children at home) and at the beginning she used to covered to protect it!!! So, think about it!